Designed exclusively for the Model 82A1/M107 series rifles, the Barrett Soft Mount attaches to the rifle’s lower receiver by the midlock pin. The rifle can then be mounted in any Mil Spec pintle socket for ease of transport and immediate operation. 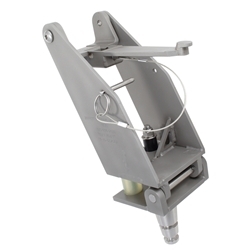 The soft mount is made from non-corrosive 300 series stainless steel so it is ideal for sea, air, or land applications. Its replaceable urethane bumpers give the user a stable, shock absorbing platform for transportation and use.